The Satoshi Treasure – a bitcoin hunt for $1 million is officially on. 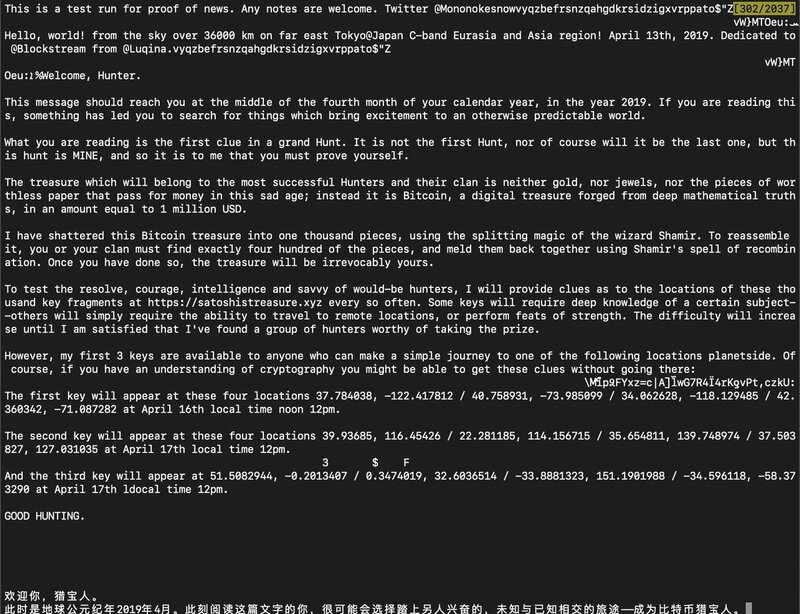 On April 13th, 2019, an anonymous user challenged the bitcoin community to resolve a puzzle and find the key for the Satoshi Treasure worth $1 million. While the broadcaster is a mystery, he reportedly plans to post any relevant clues on the following website: satoshistreasure.xyz. In addition, the owner of the cryptic message plans to reveal three keys to the reward that will be be published in the next few days. It is not the first Hunt, nor of course will it be the last one, but the hunt is MINE, and so it is to me that you must prove yourself. What the creator of the Hunt has done is split the final million dollar bitcoinucopia into one thousand pieces, using the “splitting magic of the wizard Shamir.” The successful hunter should find 400 of these “magical pieces” and the Israeli cryptographer Adi Shamir secret key sharing scheme to actually receive the prize. The broadcaster of the message will release further details on April 17th and April 18th, 2019.